A wonderful tour with 1.952 crisp altitude metres promises the uphill mountain bike route across the Maiskogel. In between is a downhill section to the quaint Ederalm in 1.420 m above sea level. 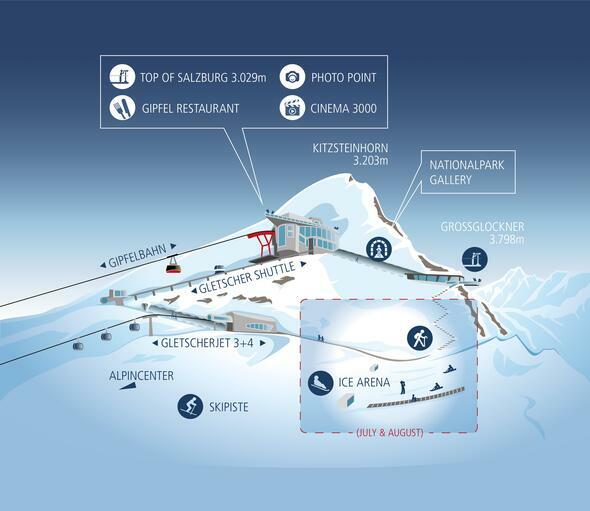 The route continues uphill past the Salzburger Hut – the oldest building at the Kitzsteinhorn. This is followed by a section across the Langwiedboden uphill to the Alpincenter in 2.450 m above sea level. Here you get off your bike and enjoy the view to Kaprun and Lake Zell. The Restaurant Gletschermühle is perfect for a stop. Tip: The tour is also suitable for E-bikes; a charging station is available at Restaurant Gletschermühle (2.450 m). Sporty cyclists on E-mountain bikes conquer the challenging uphill ride to the Kitzsteinhorn with supported pedal power. If the battery level drops after the long ascent across the Maiskogel to the Kitzsteinhorn, then you simply recharge the E-mountain bike at the Restaurant Gletschermühle charging station in 2.450 m above sea level. Thanks to the recharged battery, the ascent on the way back to Kaprun can also be taken without any problems. The E-bike charging station is open in summer only .